Here’s a list of some of the questions George Noory and I will try to answer. I’m sure we won’t get to all of them; so do check out my answers here. On the show tonight I intend to declare and will explain why the year 2009 will be remembered as the first year of the new, Aquarian Age. I call 2009 the “Terrible Twos” of the Cosmic Night Cycle. It lasts 36 years. It is a time for emotive and intuitive history. Find out why year two terrible? 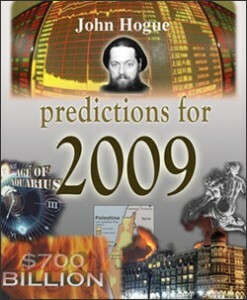 In my last book of annual predictions, I accurately foresaw the coming of deep economic recession. Appearing on Coast to Coast back in January 08, I told George Noory what would follow recession: a two-year “probation” that would lead to a slow recovery or a worse economic depression never before seen. Which future has momentum? Find out what my prediction will be about President Obama’s stimulus plan. Will it work? Today Israel had national elections. As far back as September of last year, I predicted the rise of Netanyahu and the right-wing Likud Party coming back into power. Find out my take on the future of Arab/Israeli relations. In Predictions for 2009, I quote Netanyahu from back in 2006, saying the following, “When I form a new Israeli government, we’ll do what we did in the past against Saddam’s reactor, which gave us 20 years of tranquility.” Find out what desperate military gamble he’s contemplating here. In Predictions for 2009, I describe the two most dangerous hot spots for international crisis coming to close a karmic circle this year. They are a consequence of two partitions of Palestine and India in 1947. Find out if India and Pakistan go to war. We’ll discuss whether the Israeli-Palestinian Peace process will reboot once again. I release these annual prophecy books around the time of the Chinese New Year. What is waiting for China in this New Year of the Ox? What earth changes are coming in 2009? What with record snow, ice storms and blizzard events across North America, record snows in Britain and France, is global warming in a deep freeze? Can science predict the future or is it only the dominion of soothsayers? What do I think will happen in 2012? Are we heading for a new cold war standoff with Russia? What in general do I see happening in Obama’s first term in office? I say al-Qaeda plays by the numbers when dating attacks. Find out if this indicates what dates leave America vulnerable to attack? Also, listen in to find out why I believe America is more vulnerable to al-Qaeda attack then at any other time since 2001. Osama vs. Obama in Pakistan: Are these two candidates for Nostradamus’ third antichrist? I will also talk on Coast about an upcoming seminar at Conscious Life Expo in Los Angeles, California, held at the LAX Hilton Hotel this weekend on Saturday at 8 p.m. (Pacific). I’ll also describe the two meditations I’ll be leading at the seminar: they are called Kundalini and Gourishankar (the Mt. Everest Meditation). This entry was posted in Prophecy and tagged Coast to Coast AM, economy, forecast, George Noory, John Hogue, Netanyahu, Predictions for 2009, prophecy. Bookmark the permalink. Post a comment or leave a trackback: Trackback URL.